It’s hard enough to be dealing with a toothache, sensitive gums, or severe bad breath (halitosis). But, when your dentist informs you that root canal treatment, is necessary to remedy an oral issue, you probably freeze. Anxiety can take over. Fear can flood your entire body. You probably have no idea what root canal therapy even entails. How much does it cost? Can you avoid it? At Salvatore Dental, we understand your apprehension toward dental procedures, but we’re here to reassure you of the benefits to regular dental treatment, whether it be a cleaning or a root canal. In this post, we’ll share some common symptoms that lead to root canal therapy if not dealt with promptly. If you have severe teeth pain, debilitating sensitivity to hot or cold on your teeth, a pimple-like bump on your gums, darkening of a tooth, or swelling/tenderness of the gums, give us a call! As your Malta dentist, we strongly encourage you to schedule an appointment. 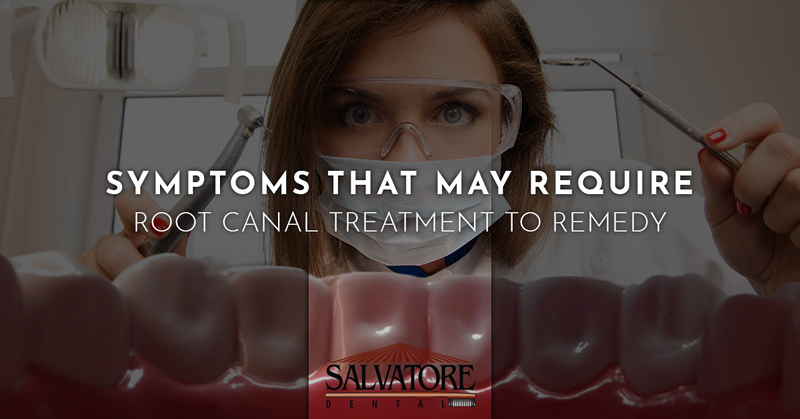 Otherwise, read on to learn more about which symptoms can lead to root canal treatment. Toothache – If you experience periodic to chronic toothaches, you may need a root canal to remedy the issue. The pain can be a dull, warm throbbing all the way to a quick, sharp pain. It’s best to consult with your local dentist on the best treatment. Temperature Sensitivity – If your teeth are sensitive to hot or cold temperatures, whether through breathing or consuming food/liquid, it can be a sign of either nerve exposure or more serious oral issues. Root canal therapy may be what you need to reduce discomfort and remedy pain, depending on the severity of your condition. Pimple/Abscess – Any type of bump or protrusion of swollen skin may be a sign of bigger oral issues. In some cases, a root canal can help reduce swelling, remedy oral issues, and remedy pain. Tooth/Teeth Darkening – When a tooth root dies, it can lead to the tooth changing colors. In most cases, the color darkens. Root canal therapy may be able to help the tooth and/or prep it for eventually extraction and implant replacement. Swollen/Tender Gums – If the gum line near a toothache is swollen and/or tender, your local dentist may consider root canal therapy. Swelling can indicate agitation, or worse, infection. At Salvatore Dental, we take our patients’ comfort and relaxation seriously. We also take pride in offering comprehensive dental services to all our patients. Our mission to deliver exceptional comprehensive dental care to all of our patients is achieved daily in our office. If you’re experiencing any of the symptoms above, don’t hesitate to give us a call. Let’s schedule an appointment! Whether you need a root canal or a different oral treatment, we will work to remedy your oral discomfort.